* Firstly Steve tell us a bit about yourself: for example your job, your family, where you live, and how long have you been an Empaccer? Right now, I have just got a new job which is going to see me managing 16 (at the moment) lawyers across three States. This will see me leave a small criminal law firm to broaden my horizons. I was with Victoria Police for 17 years before that but please don’t hold that against me! I am married with three girls who are sure to keep me under the breadline and forever stressed. I envisage long days off sitting on the verandah nursing a shotgun to ward off any males who are not of a sufficient standard! I currently live in Croydon which is the capital of burnouts and use of illegal fireworks apparently. It’s actually a great area. I have been an Empaccer over a rather extended period. I first ran for Peninsula Road Runners when I was about 8 years old (so about 1978!) or so, back in the days when guys such as Kon Butko, Ross Shilston, Burt Wright, Lindsay Beaton and Roger Preece (to name only a few of the past greats) were at their peak. It was also around that time that some very young Wallace’s were starting out. The club runs were usually from someone’s house back in the “bring a plate” days which meant there was a feast of the standard of post-Traralgon marathon proportions after every race. I went away from the sport for a few years when I turned 18 and returned to running having done the unthinkable and changed clubs. I spent a few years running for Malvern Harriers as a traitor. I still remember Mike Wheatley in those days and there was only usually seconds between us. Twenty years later and there is usually only still seconds between us! I went away from the sport for an extended period from when I was about 25 thanks to curveballs thrown my way by Life. I am now back in the MPAC fold as there was no alternative to be considered when I decided to return again! My eldest daughter, Alex, is showing a keen interest and I hope to get her in the orange very soon to make it three generations of Preece’s who have donned the colours. * When did you start on your running journey? Have you always run since then? Was there a moment as a young lad when you thought that you would be running well into your adulthood? My inspiration for running came from my father, Roger. He was an avid runner in the professional scene in NW Tasmania before we moved to Victoria in 1977. After a short stint in the PCCL, he joined PRR. Because dad ran, I wanted to run. I got off to a pretty good start and my 10k PB still stands from when I was 16 or 17 (34.50). Issues I don’t intend to bore anyone with resulted in me stopping and starting a bit; however, it is always something I have come back to. I have a deep passion for running as it has got me through some very difficult periods in my life. The saying that running is nature’s anti-depressant is something I can attest to whole-heartedly. * What other sports have you done or competed in? I did triathlons for a few years but my utter lack of interest or ability in the bike leg ultimately put an end to that chapter! I played some football, mostly in the Country where my lack of skill could be disguised by my fitness. I seemed to make a fairly reasonable centre-half forward which is where I played mostly. I played my last full season at 35 with a brief comeback after being lured to Doncaster FC in the EFL as the fitness coach. I soon realised that at 38 my speed and ability were no match for ‘kids’ literally half my age who mercilessly ran rings around me! After half the season, torn cartilage in my knee made me see sense and the boots were hung up. * What is your training philosophy? Do you follow a particular training method? Most of us know you're 'on a streak' - how long is this at the moment? The streak hits day 900 on 15 June, 2015. This only puts me about three years behind Mike when he finally decides to end his!! * What would you like to tell other Emapaccers about the non-running side of Steve? Any other talents or interesting tales to tell? The private side stays pretty private. There have been many ups and downs and I have overcome some pretty daunting obstacles over the years. The thing I am most proud of is ending up where I am now. I feel blessed to have the family I have and to be in the situation I am in. Adversity is not a bad thing. It has got me where I am now. I have achieved things I would never have thought I was capable of years ago!! The recent Boston tattoo represents a peak for me in this journey. * You've run for quite a while now. What advice would you give to those who've been in the sport not as long as you? Running is a long term prospect. It takes time and they key is consistent and smart training. Be passionate about it and aim high but never stop having fun doing it. If it stops being enjoyable figure out why and find a way to get it back! - Mike Wheatley – Machine. I want his batteries. A inspiration and a mainstay of the club. - Brimbank Park – Nice on a nice day, a nightmare when the weather gods frown on it…..and more cowbells. - Chafing – You don’t know chafing unless it leaves a scar which is still there two months later (ie post-Boston!). Vaseline is good! - Lindsay Beaton – If we had a flag, his face would be on it. The ultimate clubman. His service to PRR/ MPAC/ AV is unsurpassed. 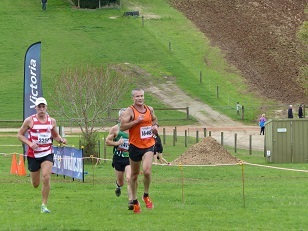 * You had an interesting experience during the Lardner Park 8k Cross Country race recently. Would you like to expand on this? For the first time in many years of running I was challenged to a fight mid-race – or I think he was proposing 12 rounds at the end! He took great offence at me going past him and gave me some lip. I thought he was being hard on himself so I offered some words of encouragement which he didn’t take well. He issued the challenge as I left him in my wake. When I spoke to him after the race he must have lost the energy: he elected instead to walk past angrily ☺. I understand Mike Manders may have had a similar encounter. The fella probably doesn’t realise how fortunate he was to have not interacted similarly with one Brett Anthony. * You also had another unique experience recently, when you competed in the Boston Marathon 2015. Can you describe the week you had there for us? Boston was an unbelievable experience. The road to Boston involved qualifying at Melbourne in 2013 and then bettering my qualifying time in 2014. The event is organised better than anything I have ever seen before and makes MM look amateurish by comparison. The whole of Boston goes into a frenzy in the days/ weeks leading up to ‘Marathon Monday’. The day starts with 30,000 people being bussed out to the start on school buses to Hopkington High School were you are met by snipers on the roof. The holding area is three massive marquees where they serve bagels, coffee and assorted other goodies which are very hard to ignore. The temperature was about 6 degrees celsius so thousands were trying to huddle together to avoid the intermittent showers that made it even cooler. Those who got off the bus wearing only a t-shirt over their gear looked a bit concerned and rightly so!! About 30 mins before the start, we were ‘released’ to make the 1k or so journey to the start line. The minute before the start was a cascade of outer garments being dumped onto the spectators lining the start. Then it was go time. The seeding of the start means that despite the number you get a clean run from the outset. After 4.12 for the first 1k it was smooth sailing from there. My pace was on 4.01 comfortably until about 20k when I needed an unscheduled pit stop. This was long enough for the hammies to tighten a little bit and the cold just didn’t seem to want to let them loosen again. Even so, I managed a 4.07 pace from there to the finish. The course is fantastic: an undulating and quite picturesque course which is lined with literally hundreds of thousands of screaming spectators. They really get behind it and make it deafening in parts, especially up the Newton hills. This definitely took your mind of the freezing rain and the 20 mph headwind! The run into central Boston is amazing with the streets being completely packed with screaming people. I managed a PB 2.55.26 which I was absolutely stoked with in the conditions. The effect of the cold then hit and I very nearly became one of the 1300 people who needed attention for hypothermia. After a warming up which included standing in a shower for 20 minutes drinking coffee, I recovered and managed to get out for a burger and a few beers. All in all, an amazing experience and the highlight of my running so far. Personally it represented something very significant as I would have rubbished the prospect of me ever doing that a few years ago. * What are your running goals for the rest of 2015 and beyond? * Any other goals (non-running)? After yesterday (I am finishing this after an horrible day out at Bundoora) I plan to take a bit of a lower profile approach to my running for a while. I have thrown the watch away and the focus is going to be on enjoying my running. I have been putting a lot of pressure on myself in many aspects of my life lately as well as having a lot put on me from elsewhere. * Thanks for your time Steve, good luck for the rest of the Cross season.